Stacey Abrams was the Democratic nominee in the Georgia gubernatorial race last year, narrowly losing to incumbent Governor Brian Kemp. Her party nevertheless still has great confidence in her, as she was selected to deliver the Democratic response to Donald Trump‘s State of the Union address. Abrams took the stage last night shortly after Trump finished his speech, introducing herself to the American public. She began her 11-minute rebuttal by discussing her childhood, explaining how her family alternated being in the lower middle and working classes. Her mother was a librarian and her father a shipyard worker, both of whom instilled their values in their children. Sometimes her father hitchhiked to his job since the family only had one car. One night it was raining, causing Abrams’ mother to start worrying for his safety. They left and found him hitchhiking without his jacket, explaining that he gave it to a homeless man. When asked why he’d give away his only coat, Abrams’ father explained how he knew his family is there to support him while that homeless man would would still be alone when he left. It’s an anecdote that embodied the nature of the United States’ mantra, how hard work and brotherhood is fundamental. 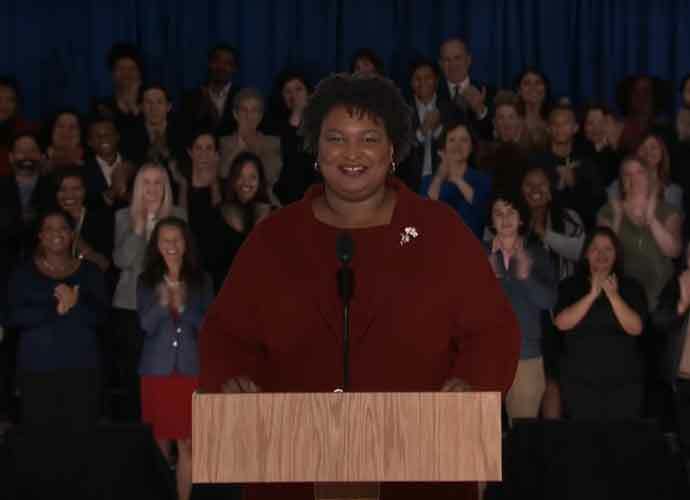 Abrams continued, discussing how these values inspired her to run in Georgia and, a few weeks ago, to join volunteers in distributing “meals to furloughed federal workers.” She described the partial government shutdown as a “stunt” Trump “engineered” (originally, Schumer and Nancy Pelosi convinced Trump to own a shutdown, although Trump had since tried to blame it on Democrats), and chastised it for betraying the country’s values. She also addressed American families, most of whom are living paycheck to paycheck and lack the safety net labor unions provide. The recent Republican tax is bill “rigged the system against working people,” she added. Other areas are in need of progress too, such as climate change, which House Democrats see as a priority. And although Abrams did acknowledge her loss to Kemp, voter suppression is another problem she believes must be addressed.